The cache is a nano, hidden close to the village sign, with a range of parking options very close by so ideal for a cache n dash. The Village Sign is situated on the village green, at the centre of the village, in front of ‘The Row’ – reputed to be the longest row of terraced thatched cottages in the country. Weeting is one of the earliest inhabited parts of Norfolk, the flint mines at Grimes Graves confirm this. Items of pottery, coins, brooches etc found in Weeting prove that Bronze Age people, Romans and Saxons also had settlements here. When the Normans arrived they built Weeting Castle and Broomhill Priory. Weeting is listed in the Doomsday Book, spelt "Wetynge" - meaning wet fields. In 1642 Thomas Shadwell, the Poet Laureate, was born at Bromehill House, on the site of the old Priory. In the late 1700's the village was feeling the effects of the Enclosure Act and in 1770 Lord Mountrath bought most of the parish and built Weeting Hall. On the death of the Earl the estate passed to his cousin, Lord Bradford. Not caring much for Weeting he sold it to John Julius Angerstein, a wealthy merchant, patron of the arts and philanthropist. The Angerstein's became the squires of Weeting until the death of William Angerstein in 1897 when the estate was sold to Thomas Skarratt Hall, who had made a fortune in the Australian gold mines. In 1917 the estate was sold to Sir John Calder, a timber magnate. In the 1930's Weeting Hall was used as a training college for unemployed men. 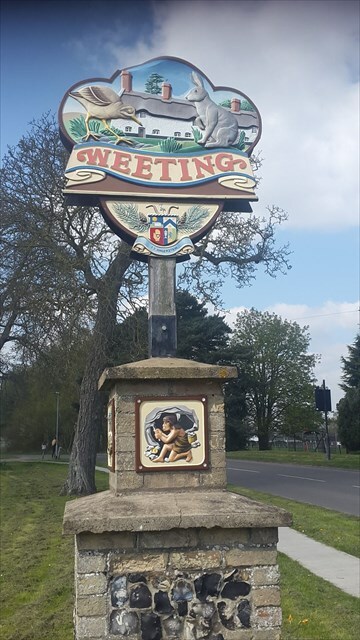 During World War II some 500 Polish families, who had been displaced by the Germans and Russians, were settle in Weeting and Brandon. During this time the hall was used as a hospital for wounded Indian and Gurkha soldiers, Weeting Hall was demolished in 1954. Much new housing was built and the face of the village changed yet again. However, look deeper and one will find there is much to discover from the past.